Backed with expertise and knowledge in this domain, we are counted amongst the foremost manufacturers, suppliers and exporters of Cargo Nets. Made by using highly durable materials, these nets are available in various standard dimensions. 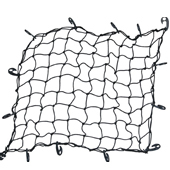 These nets find wide application in the marine industry for lifting the goods for shipment. Our customers can avail from us a wide range of Cargo Nets which is available in different sizes of minimum 8 / 8 feet and maximum 20 / 20 feet.